Even less than the decline of color film, because the "Photography" class at schools are now a class of how to use Adobe Photoshop, instead of how to develop B/W film and print their photos. I can see that, as most darkrooms that were done "manually" seemed to all be for B&W. As color involves temperature requirements and multiple additional steps to be done right. Mind you, I found some small "desktop" processors for the likes of E-6 and C-41. A little larger then like the manual JOBO's but still tiny compared to your processor at your shop more then likely. Even so, their small size, would probably take a few hundred rounds of film to make it "economical" to purchase one of those for school labs etc. Digital cameras are manufactured to work in colour, with B&W a mere afterthought. I think one thing that digital camera's allow, beyond a manufacturer to care if they are in color or not. Its the fact that most people are doing extensive post processing of the pictures to make everything prefect. It in some ways has gotten us, myself included lazy. No more does one need to worry about light exposure, or how the enviroment will interact with our pictures, just plug the memory card into the computer and "fix" our mistakes when we take pictures. That reason is one of the ones as to why I bought a Film SLR. If I am going to take pictures, I better have a understanding of what I am doing. Digital photography allows anyone who knows how to use a keyboard to be a "pro". ...Digital photography allows anyone who knows how to use a keyboard to be a "pro". As a photographer I make a brilliant bricklayer mate. I could never get my head around all of the bits and pieces and setting required to take a good picture...even with my aperture priority Mamiya ZE Quartz SLR film camera (that I still have). The introduction of digital cameras has turned me into a pretty reasonable photographer...the electronics takes the "Vince" factor out of the equation. So hows the quest for the "electronic" gun going? Yeah...I know that feeling well too mate...but I still derive pleasure from simply shooting...that's all that matters. When I'm shooting Clays, I tell everyone I'm having twice as much fun as them 'cause I'm shooting twice as many rounds. It is ok, I feel the same way. Got the Camera in the mail, but I am a little embrassed to mention what happened next. I took the camera out with me today after picking up at the post office this morning. The picture of the lens looked a little too foggy but more on that later. So I went to get the film from camp developed (will post pictures later tonight), and well, decided to pick up some Fuji Velvia 100, expensive stuff locally (18$ a roll, but they give you a 50% off when you process coupon, which when mounted to slides, ends up knocking off 8$ from the processing fees which ain't all that bad. So a roll plus mounting to slides is only 26$, which is about the best deal in town for E-6 that I've seen. Anyways, so I get to the store, buy the film, a strap (Made in USA ones were cheaper then imports ), and a lens cleaner. But as I head out of the store to wait for the 1 Hour processing and print time, I realize, no matter what I do I can't open the door to load the film. So I go back into the store, needed LR44 batteries for the light meter too, and the guy shows me that I was right there, on the right track, lifting up the rewinder but I needed to "pop" it up alittle more to get the door to open. Anyways I felt very foolish at that point, but loaded the film anyways. Fiddled around for a bit and got the light meter working. But, I realized something else, the lens just wont do as it is. So I wait till I get home. So here I am, home now, after spending a hour, disassemblying the lens, cleaning the one single lens about 5 lenses in that was cloudy, reassembling the lenses with a latex glove carefully cleaning each one as I put them back with a eye glasses cloth. When I realize, I can't see anything out of the lens. Must have put them back in the wrong way, and sure enough I did, after about a dozen attempts and using Wikipedia's block diagrams of other lenses I somewhat made sense of the situation and got it working. So there you have it, first day with a SLR, and I have issues with the loading of the film, the light meter, and putting back together the nickle sized lenses back into the lens body in order. But it is all working now. I think. Well, that just about covers everything except the actual photo taking. Welcome to ancient technology, where half the fun was getting it to work. You know know your camera and lens' better than a lot of the repair facilities that are left. By "cloudy" did you mean they looks like spider webs or just plain foggy? If it is spider web, then your lend has fungus growth on the coating, this is not good sign! If it is foggy, this is usually because of humidity, simply place this lens in a dry place and sooner or later the lens would clear itself. I have place my lens inside an oven (fired the oven up to about 110c then switch off, and wait till it gets down to about 80C, then place the lens in it till the temperature came down to about 30c or so. There is no way dust or dirt can get into the lens unless being forced in or the lens dunked into dirty water. You should NOT disassemble the lens! even with clean environment, you may still get bad things entering your lens assembly. Eg. dust, lint, fungus spores etc. 8O You disassemble the lens???? Just the back part of it, where there are the nickle sized lenses that are fixed and do not move. 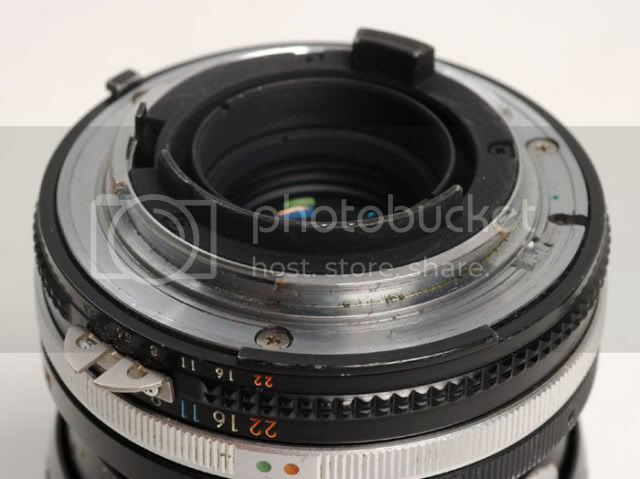 If you look at this picture I copied off the internet you'll see the lenses fixed by the small spanner in this lens (as a example), those are the ones I took apart. There are like 8 little lenses in there. That need to face the right way or it doesn't appear to show up in the view finder as a picture, which is what I was working on getting right, I had mistakenly reversed the orientation of a couple of them in my mind as I took them out. Thought I was careful at making sure I knew how they came out. It looked foggy, from the moment I got it, and it wouldn't disappear. When I took the lens apart, it was clearly a dirt issue I think. It took me a good 5 minutes of cleaning the lens with anything I could think of (rubbing alcohol, windex, dish soap etc) to get that white haze to get off the one lens that it was on. And I still only got about 90% of it, what ever it was off, there is still a bit more, but doesn't appear to effect the lens looking through it, or the camera viewer. Definitely not humidity. True, but I figured I had nothing to lose. As it seemed to not be a humidity issue with it. Took my time and make sure that the lenses were cleaned as I put them back in, and used the cap in between lens insertions. you are a brave man D I wouldnt dream of doing that job. Gelandangan I sure wish I was closer to your store cause you would get all my work you certainly know your stuff. You don't know the half of it mate...Gelan is a wizard with cameras and electronics. I reckon he has probably forgotten more than most of us will ever know. Thats a heavy accusation Vince. Elvis, thanks for the confidence mate!